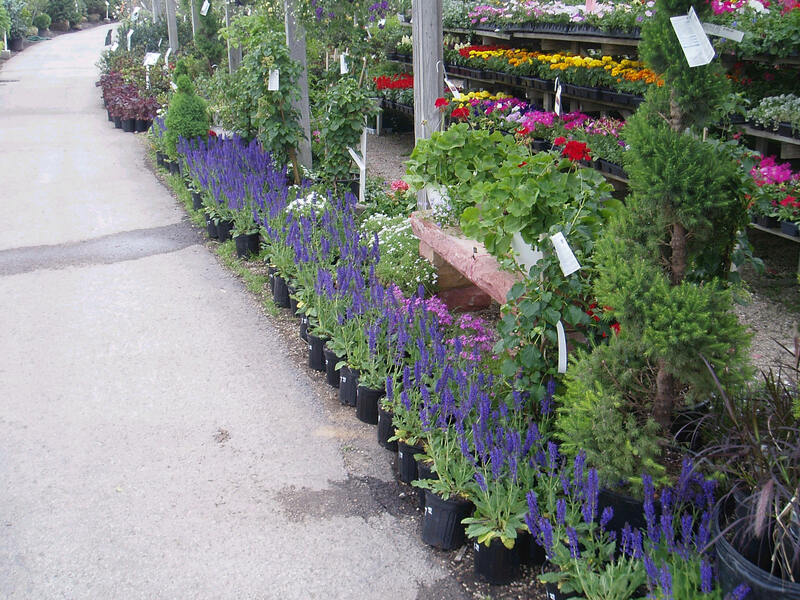 At Home Landscape Materials Inc. we carry a wide variety of Perennial plants that are perfect for you home or garden. We have been providing superior perennial plants to Chicago area residents since 1977. Come see our 10 acre Perennial Plant Garden Center located at the border of Naperville & Bolingbrook and find the perfect Perennial for your garden! Our plants come highly rated as one of Chicago’s premier nursery. So if you are looking for ideas of perennials, rose bushes, ornamental grasses, ground covers, or vines, we have you covered! Allium, Purple Sensation 1 gal. Allium, Summer Beauty 1 gal. Asparagus, Jersey Giant 1 gal. Aster, Purple Dome 1 gal. Aster, Purple Dome 2 gal. Astilbe False Spirea 1 gal. Astilbe Visions in Pink 1 Gal. Astilbe Visions in Red 1 Gal. Astilbe Visions in White 1 Gal. Bee Balm, Jacob Cline 1 Gal. Bee Balm, Petite Wonder 1 gal. Bellflower, Blue Uniform 1 gal. Bleeding Heart, Luxuriant 1 gal. Brunnera, Hadspen Cream 1 gal. Brunnera, Silver Wings 1 gal. Catmint, Cat’s Meow 1 gal. Clematis, Rose Combo Pot 15 gal. Columbine, Blue Shades 2 Gal. Columbine, Blue Bird 1 gal. Coneflower, Big Sky Sundown 1 gal. Coneflower, Butterfly Kisses 19 CM. Coneflower, Green Envy 1 gal. Coneflower, Pixie Meadowbrite 1 gal. Coneflower, Powwow Wild Berry 2 gal. Coneflower, Purple NGN 1 gal. Coneflower, Sombrero Salsa Red 1 gal. Coneflower, Sombrero Salsa Red 2 gal. Coral Bells, Alabama Sunrise 2 gal. Coral Bells, Caramel 1 gal. Coral Bells, Citronelle 1 gal. Coral Bells, Lime Rickey 1 Gal. Coral Bells, Palace Purple 1 gal. Coral Bells, Paris 1 gal. Coral Bells, Pistache 1 gal. Coral Bells, Plum Royale 1 gal. Coral Bells, Rio 1 gal. Coral Bells, Rio 19 CM. Coral Bells, Royal Red 1 gal. Coral Bells, Tiramisu 1 gal. Coral Bells, Zipper 19 CM. Coreopsis, Creme Brulee 1 gal. Coreopsis, Creme Caramel 1 gal. Coreopsis, Jethro Tull 1 Gal. Coreopsis, Moonbeam 1 Gal. 19cm. Daylily, Cherry Cheeks 1 Gal. Daylily, Cherry Cheeks 2 gal. Daylily, EarlyBird Cardinal 1 Gal. Daylily, Happy Returns 1 gal. Daylily, Lavender Tonic 1 Gal. Daylily, Little Business 1 Gal. Daylily, Moonlight Masquerade 1 gal. Daylily, Rocket City 1 Gal. Daylily, Rosy Returns 1 gal. Daylily, Ruby Stella 1 gal. Daylily, Siloam Peony Display 1 gal. Daylily, Stella D’Oro 1 gal. Delphinium, Blue Mirror 2 gal. False Indigo, Midnight 1 gal. False Indigo, Vanilla Cream 1 gal. Fern, Autumn or Japanese Sword 1 gal. Fern, Branford Beauty 1 gal. Fern, Dre’s Dagger 1 gal. Gaillardia Arizona Red Shades 1 gal. Gaillardia Arizona Sun 1 gal. Geranium, Jolly Bee 1 Gal. Goldenrod, Little Lemon 1 Gal. Helilopsis, Summer Sun 1 gal. Hibiscus ‘Blue River II’ 3 gal. Hibiscus ‘Cranberry Crush’ 2 gal. Hibiscus ‘Lord Baltimore’ 3 gal. Hibiscus ‘Mars Madness 2 gal. Hibiscus ‘Summer in Paradise’ 1 gal. Hosta, Autumn Frost 1 Gal. Hosta, Autumn Frost 2 Gal. Hosta, Big Daddy 1 Gal. Hosta, Coast to Coast 1 gal. Hosta, Coast to Coast 3 gal. Hosta, First Frost 19 CM/1 Gal. Hosta, Frances Williams 3 gal. Hosta, Medio Variegata 1 gal. Hosta, Orange Marmalade 1 gal. Hosta, Stained Glass 1 gal. Hosta, Touch of Class 1 gal. Iris, ‘Caesar’s Brother’ 2 Gal. Iris, Ruffel Feathers 1 Gal. Lamium, Shell Pink 1 gal. Lamium, White Nancy 1 gal. Lily of the Valley 1 Gal. Lupine Gallery Mix 1 gal. Penstemon- Prairie Dusk 2 gal. Peony, Alexander Fleming 2 Gal. Peony, Duchesse de Nemours 2 Gal. Peony, Monsieur Jules Elie 2 Gal. Phlox, Blue Open Act Blush 1 gal. Phlox, Blue Paradise 1 gal. Phlox, Creeping Blue 2 Gal. Phlox, Creeping Red 1 gal. Phlox, Forever Pink 1 gal. Phlox, Fort Hill 1 gal. Phlox, Minnie Pearl 1 gal. Plants That Work 1 gal. Primrose, Siskiyou Pink 19 CM. Salvia, Dimension Rose 1 gal. Salvia, East Friesland 2 gal. Sedoro Blue Elf 19 CM. Sedum, Autumn Joy 1 gal. Sedum, Lime Zinger 1 gal. Shasta Daisy, Alaska 1 gal. Shasta Daisy, Banana Cream 1 gal. Shasta Daisy, Becky 1 gal. Shasta Daisy, Light N Breezy 1 gal. Shasta Daisy, Limon Love 1 gal. Shasta Daisy, Victorian Secret 1 gal. Spiderwort, Sweet Kate 1 gal. Thyme, Pink Chintz 1 gal. Turtlehead – Hot Lips 1 gal. Veronica, Royal Candles 19 CM/1gal. Veronica, Sweet Lullaby 1 gal. Veronica, White Wands 1 gal. May Night Salvia (pictured above) is one of most popular perennials due to its bright color and long lasting flowering period (spring, into summer). A favorite perennial for planting under trees. Adds color to any planting bed. Likes shade, but tolerates sun. Grows 18-24″ in height by 12″ spread. Coral Bells are available in a few different varieties that include different colors and leaf textures. All Shasta Daisy grow 24-30″ in height and spacing should be 18-24″ apart. The Shasta Daisy prefers sun or light shade. Hybrid form of Sedum, has waxy pink-edged gray-green leaves. Large clusters of pink flowers open in late summer. Grows 24″ to 30″ tall and spacing should be 18″. Sedum, Stonecrop “Autumn Joy” is also a popular cultivar of Sedum. It grows to 24″ and has green foliage with pinkish/red clusters of flowers. The Purple Coneflower is popular for the tall raised flowers blooming in the summer, also available as “Alba Coneflower” which has white petals with the same orange/brown centers. The Coneflower can tolerate heat, drought, and winds. Grows from 24″ to 36″ tall and should be spaced 18-24″. Tolerates full sun, and prefers well drained soil. A showy type of Coneflower that has yellow petals on the flower with a dark center. “Black Eyed Susan” are compact and grow rapidly in fertile soil. Grows up to 36″ tall and spreads close to 20″. Blooms last from midsummer to fall. Hardy Mums are a very popular perennial to add fall color to your landscape. Mums range from 12″-24″ tall and spread up to 18″. Flowers come in late summer through the fall. Can handle full sun to part shade and prefer well drained soil. New England Aster- wide color range available. Flowers in late summer into fall, grows 18″ tall x 15″ wide. Compact branching habit makes for full compact flowers in fall. At Home Landscape Materials Inc. we assist in a variety of landscaping needs for homeowners or businesses. There are many things that you can do with your yard and we will happily assist you in choosing what type of plants and trees to put around your home. Come visit our ten acre garden center for any plant or gardening need. perennials	Overall rating:	5	out of 5 based on 1	reviews.